Brilliantly easy, healthy, flavour-packed, accessible and affordable veg recipes. Jamie's Christmas Cookbook will be packed with all the classics you need for the big day and beyond, as well as loads of delicious recipes for edible gifts, party food and new ways to love those leftovers. It's everything you need for the best Christmas ever. Jamie gets the nation cooking clever, shopping smart and wasting less. Jamie's fourth book - a Number One international bestseller reissued with a stunning new cover. Jamie's fifth book - a Number One international bestseller reissued with a stunning new cover design. Jamie finds inspiration in the vibrant food of popular short-haul destinations from Morocco, to Greece, to Sweden. Jamie's second book - a Number One International bestseller reissued with a stunning new cover. Jamie's third book - a Number One international bestseller reissued with a stunning new cover design. Jamie's first book - a Number One international bestseller reissued with a stunning new cover. The food adventure of a lifetime. Jamie's ultimate road trip, travelling around the USA. 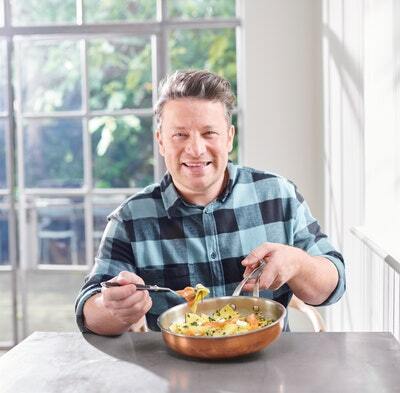 If you're a complete beginner in the kitchen, Jamie's promise to you is that you'll be making some great dinners within hours of reading his book. A little knowledge and a few basic tools can go a long way, and this book is your first step . . .